Transportation directors from North America’s largest cities have announced the release of a new design guide for building world-class transit streets—providing a framework for cities to grow without slowing down, while making city streets great places to be. The Transit Street Design Guide, published by the National Association of City Transportation Officials (NACTO), is a blueprint for the future of mobility in cities. At a time when cities across the continent are experiencing rapid growth, transit is the key to unlocking street space and moving people to where they want, and need, to be. While cities have been introducing high-quality transit to their streets at an accelerating pace, there was no comprehensive guide to incorporating safe, transit-first urban street design in the North American context. 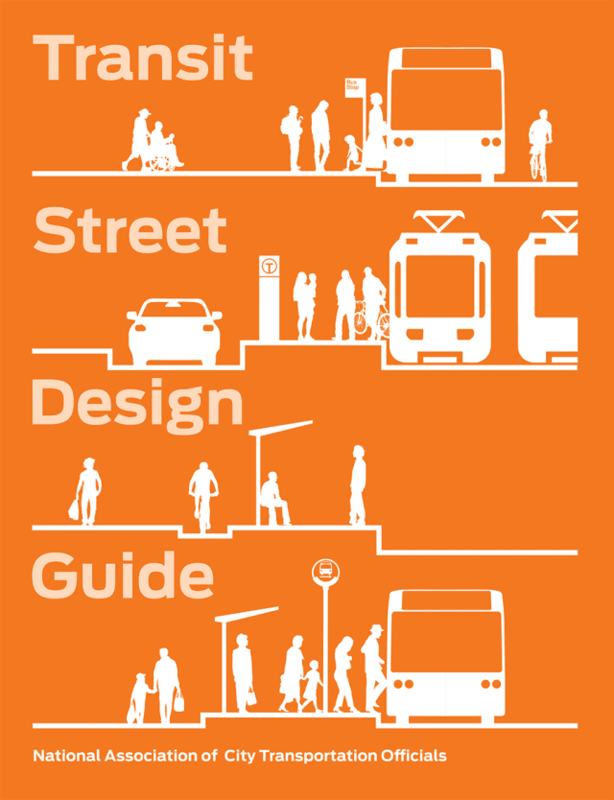 Developed by officials and practitioners from the 45 NACTO member cities, along with 18 participating transit agencies, the Transit Street Design Guidefills the gap, providing the tools to actively prioritize transit on the street. In developing the Guide, NACTO worked with TransitCenter, the American Public Transportation Association (APTA) and the Institute of Transportation Engineers (ITE), identifying projects and techniques worth replicating. The Guide highlights transit as the centerpiece of transformative street projects, such as shared transit streets and transit boulevards, along with best-practice strategies—like all-door boarding and transit-friendly signals—that can speed up an entire system. In-depth guidance covers dedicated lanes and on-street transitways, boarding islands and other active-mode-friendly designs, as well as intersections and turn management. The Guide places these design techniques in a framework of transit network concepts like rapid service and grid networks, and provides comprehensive evaluation techniques to measure the entire street, going beyond conventional metrics. “Public transit customers want speed and reliability, but this goal can collide with desires for slow and intimate streets. Great streets can do both, and this guide shows how,” said Jarrett Walker, President and Principal Consultant of Jarrett Walker + Associates and author of Human Transit. The Guide is a complement to NACTO’s influential Urban Bikeway Design Guide and Urban Street Design Guide, which have set the bar for successful 21st-century multi-modal streets. The guides can be endorsed or adopted by individual cities, counties, or states and provinces as either a stand-alone document or as a supplement to other roadway guidance documents. The Transit Street Design Guide is available for purchase from Island Press (islandpress.org) and will soon be available as an interactive document at nacto.org. Development of the Guide was supported by TransitCenter and The Summit Foundation, and was published in partnership with Island Press. NACTO is an association of 45 major North American cities formed to exchange transportation ideas, insights and practices and cooperatively approach national transportation issues. Member cities include Atlanta, Austin, Baltimore, Boston, Charlotte, Chicago, Denver, Detroit, Houston, Los Angeles, Minneapolis, New York, Philadelphia, Phoenix, Pittsburgh, Portland, San Diego, San Francisco, San Jose, Seattle, and Washington D.C. Affiliate member cities include Arlington VA, Boulder, Burlington, Cambridge, Chattanooga, El Paso, Fort Lauderdale, Hoboken, Indianapolis, Louisville, Madison, Memphis, Miami Beach, Montreal, Oakland, Palo Alto, Puebla, Salt Lake City, Santa Monica, Somerville, Toronto, Vancouver BC, Vancouver WA, and Ventura.